The food service choice for a wedding is one of the easiest ways to convey the formality — or the casualness – of an affair. “A sit down, served dinner is always more of a formal feel,” says Melissa McGrath, manager at McGrath Clambakes and Catering. “A buffet or family style can be more casual, but there’s also more flexibility and the option to offer a wider variety of food.” Buffets can be more difficult to navigate for female guests in long dresses, so the more formal the attire, the food service choice should follow. There’s also no reason to choose just one service style. 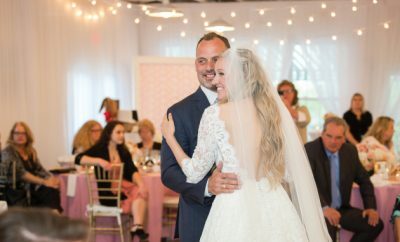 Elaine Twombly, Executive Director at The Catered Affair, has coordinated weddings with a mix of family style and full service. “Passing bread is a lovely family tradition and something you can bring to the wedding,” says Twombly. “Side dishes work well in a family-style setting, while the main protein is still served tableside.” Twombly suggests long tables and smaller weddings are the best fit for family-style dining, as other seating arrangements don’t allow for much room on the table for large food dishes when florals, décor and stemware are accounted for. An interesting food preparation process is a great way to engage and entertain guests during cocktail hour. McGrath Clambakes, for example, cooks their clambakes in the New England tradition, using rocks, seaweed and wood over a fire and hot coals. 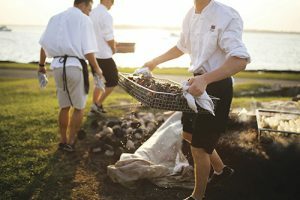 “When the time comes, the bride and groom ring the traditional dinner bell which signals the guests to make their way over to the clambake,” says McGrath. The chef then explains exactly what’s involved, then peels away the canvas covering to reveal the cooked food. “It’s a nice segway for all of the guests to then head back to their seat to enjoy the meal.” Guests get a sense of how local the food is, and exactly how it’s prepared, which adds to the wow factor. When deciding what, when and how to serve food, couples should consider how each food factor will convey the attitude of their event. Couples are getting more creative with their sweet and savory after-meal choices. “Display and cutting cakes are here to stay due to the tradition,” says Twombly. “But, for desserts that are being served to guests, there are almost endless options.” For a fall wedding, pie stations or mini jar pies served in mason jars with local fall produce are a fun option. In the summer, ice cream sundae bars or ice cream trucks are all the rage. 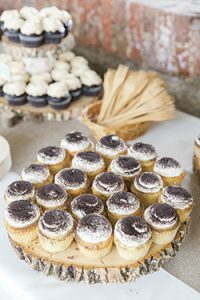 Candy stations, donut walls and cupcake towers are all ways for a couple to share their sweet tooth preferences with guests — and provide variety. Dessert is also a great way to showcase a sweet treat from the bride or groom’s culture or childhood. Twombly remembers a couple who had grown up eating Funfetti cake for their family celebrations, and they brought that tradition into their wedding. Couples should consider what sweet treats are impactful in their lives, or their life together, and share that with their guests. 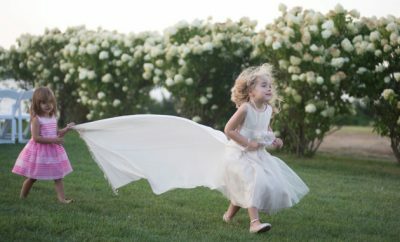 The modern wedding weekend often encompasses more than just the ceremony and reception. “These are also opportunities for a bride and groom to choose a menu that showcases their personalities, their family histories or their shared history,” says Twombly. For a brunch, lunch, welcome dinner or rehearsal, consider dishes from favorite restaurants or places that mean something special. It’s a great conversation starter for guests. For smaller parties, take the celebration right to that favorite restaurant and let guests choose for themselves. Cocktail hour is a delicate balance between keeping hungry guests happy without overshadowing the meal to come. “We budget our food so that every guest can have between one and three samplings of food before dinner,” says McGrath. “You don’t want to go crazy with too many options so that guests either try too much, or are overwhelmed with choices, but of course you don’t want hungry guests, either!” McGrath suggests ideas like chowder stations in the colder months, raw bars, charcuterie and cheese, and other finger foods. Since cocktail hours traditionally don’t have as much seating, keep the food simple so that guests can easily hold it in one hand and a drink in the other. Twombly suggests the idea of edible centerpieces — something to keep the guests satiated between courses, or to take the place of a served starter. “Charcuterie boards, interesting bread baskets, and other easy-to-grab foods are great placed on the table,” she says. This way, when guests sit down for their meal, they have something to nibble immediately. Food is an ideal opportunity for guests to learn about the history and culture of both the bride and groom. “Make sure guests understand why you’ve chosen the specific dishes,” says Twombly. A menu card explaining the choices and their origins is a great way for guests to learn a little something and have a connection with what they’re being served. 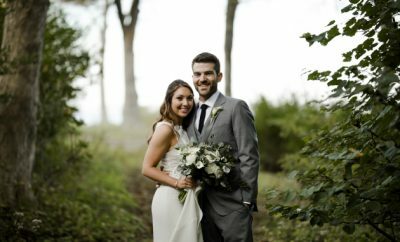 “For example, if the groom is from Kentucky, we’ll choose some foods that have a nod to bourbon.” Look for inspiration in childhood, shared experiences, favorite vacation places or secret family recipes. Using food as a guest favor can wind family tradition into a wedding. Ask beloved family members to bake favorite cookies or sweets as a take-home treat (Jason & Calindy did that!). Local honey, homemade jam and other easy-to-travel edible items also allow guests to bring a little piece of the wedding home with them. Signature cocktails are increasingly popular at weddings these days, says Edick. 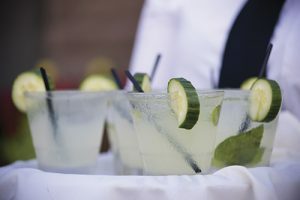 “When folks show up to the cocktail hour, it’s nice to have a drink ready that represents what the bride and groom like.” While signature cocktails don’t rule out an open bar, they provide guests with a little more guidance and an opportunity to try something fun. Cheeky names encouraged! Beyond cocktails, a couple can opt to pick certain brands of liquor or wine that are particularly meaningful or tie into the theme of the event. Alternately, consider setting up a tasting bar rather than a specific single cocktail — a martini bar with a number of customizations, or a whiskey tasting station with different vintages are great ways to give guests both guidance and options. Later in the evening, dessert wines and cordials are a popular supplement to late-night snack offerings — Twombly has created a cognac station with a cigar bar for a late-night wedding. The bar is an excellent opportunity to bring in more local flavor — work with your caterer to stock products from local vineyards, breweries or distilleries, to give guests a local taste.